Free Music Archive: Ducktails live WFMU session -- now on vinyl! You came this way: Home > WFMU > Blog > Ducktails live WFMU session -- now on vinyl! Ducktails live WFMU session -- now on vinyl! Ducktails' Christmas 2008 live WFMU set on Marty McSorely's show is now available on 12'' vinyl courtesy of Inflated Records. It's the label's second release -- the first is a sweet Memoryhouse 7'' with a Teengirl Fantasy remix). Ducktails Live on WFMU comes in an edition of 500, first half on yellow vinyl, and it's available starting tonight at the Glasslands release party. 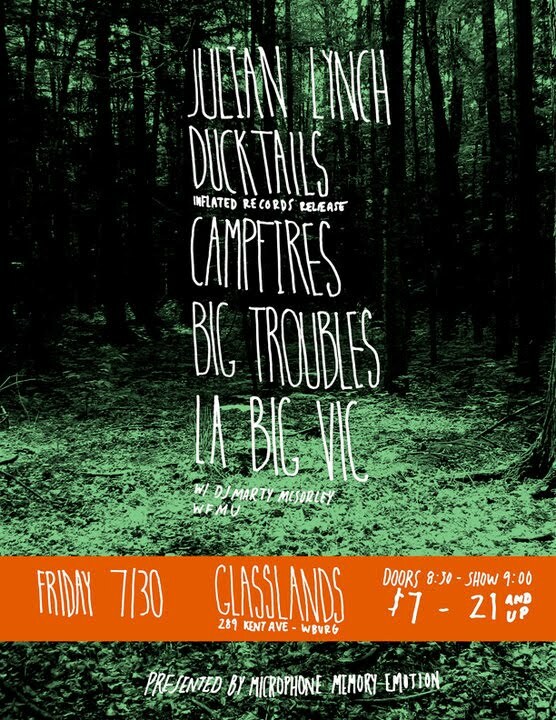 Joining Ducktails will be fellow Ridgewood NJ up-and-comers (and tour-buddies) Big Troubles and Julian Lynch, plus Chicago's Campfires, Brooklyn's La Big Vic, and the aforementioned DJ Marty McSorely. Ducktails = Matt Mondanile of Real Estate, joined occasionally by friends and cohorts, and his live WFMU session was a pivotal moment in my appreciation of this underwater beach-jam project.